Description: Chart Control .NET is the perfect solution to add the most advanced, feature rich charts to Windows Forms and ASP.NET applications. 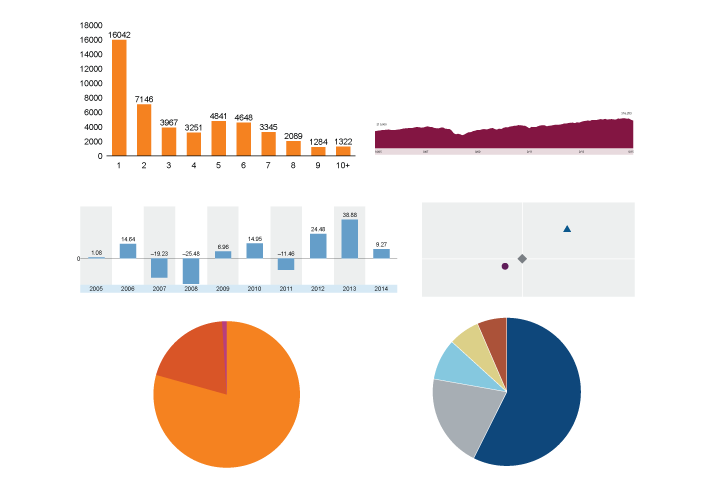 Over 40 2D/3D charts are available. Flexible areas filling, scaling, legends, grid, context menus and drill-down. Uses OpenGL (3D) and GDI+ (2D) for fast-rendering charts. Package includes Chart Control itself, XML driven toolbar, chart configuration control, and arts to decorate chart area. Description: Most comprehensive Library of .Net components for Delphi. Includes over 30 essential .Net components which are available in Delphi like Active Directory components, Internet components, printing components, system components and many more for building powerful line-of-business Windows applications in Delphi. Description: Most comprehensive Library of .Net UI Controls for Delphi. Includes over 30 essential .Net components which are available in Delphi like Input Controls, List & DropDown Controls, Layout Controls, WebBrowser Control, Calendar Controls, Button Controls, Navigation Controls and many more for building powerful line-of-business Windows applications in Delphi. Description: The .Net DLL/WSDL Importer for Delphi is used for importing .net assemblies, WSDL or web service XML schema which generates Delphi classes from the types of the imported assemblies. This tool is categorised into two parts: Namely; Import .Net Assemblies Wizard and Import WSDL/Web Services Wizard. Description: Verify thousands of email addresses with a single line of code. The .NET Email Validation Library checks syntax, performs MxRecord lookups, and validates mailboxes. Validate asynchronously over multiple processors. The library detects curse words, checks domain typos, checks top level domains and detects fake email patterns. Also detects grey listing and blocking by anti-spam software. Download a free trial today. Description: Readers of Visual Studio Magazine named the .NET Encryption Library a winner in the Security and Copy Protection category. Encrypt sensitive information such as passwords, credit cards and social security numbers. Supports Rijndael (AES), DES, TripleDES, RC2, Blowfish, Twofish, Whirlpool, MD2, MD4, MD5, SHA1, SHA2, HAVAL, GOST, Ripend320, FCS16, FCS32, CRC32, Adler32, X509, UUencode, Base64, GZip, and Deflate. Description: .NET FontManager is a small handy open source library for .NET and ASP.NET. It provides low-level operations with various font formats. With the help of .NET FontManager you can use the common type of font files, get contours of every glyph and draw them as you need. The library is rather simple and you don't even need to know about fonts internals (besides, it is low-level). Description: The .NET FTP Library by Kellerman Software can reliably handle the worst networks. When doing any FTP operation you can actually unplug the network cable, plug it back in and it will resume right where it left off. Proxy, SSL support, and MODE Z compression come standard. The .NET FTP component can handle time differences accross FTP servers. Why pay hundreds of dollars more for another FTP component that does less?